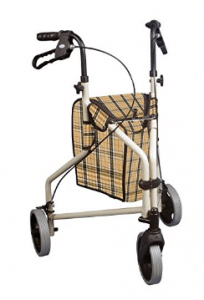 3 wheel walkers are also known as rolling walkers or Rollator. In this review, we are going to analyze the best 3 wheel walkers that the market has to offer. 3 wheel walkers are used to provide support to people who are not able to move around on their own. There are several other reasons, why one would need the best 3 wheel walker as well. Aside from offering mobility support, using a 3 wheel walker has other benefits. 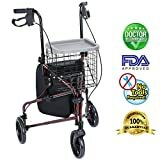 They are great for seniors who struggle to lift things as well. The best 3 wheel walkers also help the user become active by moving around. This is important because it is great for their muscles and also for their weight. Weight capacity: 3 wheel walkers are not all constructed with the same strength. Some of them can support larger weights than others. It is important to buy one which will be compatible with the user’s weight. This will help avoid any risk of injuries and damages as well. Terrain: Before purchasing a 3 wheel walker, one should also analyze the terrain. This will help you in choosing the right type of wheels for that environment. Big wheels are recommended for uneven terrain while smaller wheels work fine indoors. Brakes: Since the walkers have wheels, you need to check that the brakes they come with are reliable. It will be dangerous to ignore such a crucial feature. In case you want to stop or even lean against it, the walker should be well secured first. Storage: Some 3 wheel walkers give people an easier time when it comes to storage. They have been constructed in a manner that they can be folded down after usage. This comes in handy as well when you need to transport them or for people with insufficient storage space. We tend to put a lot of faith in 3 wheel walkers. One wrong move and a walker can make the user’s condition even worse. 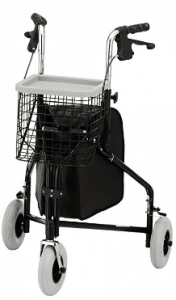 This 3 wheel walker has been approved by the FDA and also be the CE. Such approvals give you some peace of mind, knowing that the walker meets certain standards. It has been designed professionally, to ensure the user’s safety in the most convenient manner possible. This particular health line walker comes in flame red design and has a stylish appeal to it. You won’t have any trouble maneuvering it because it is very light. It weighs about 11.9lbs in total, so lifting it even when you want to get into a bus will not be much of a hindrance. It was made so that it can be used in any environment. The 3 wheel walker will come in handy both indoors and outdoors as well. The 3 wheel walker is very sturdy. You will not need any tools to assemble it. In order to ensure that this 3 wheel walker offers maximum maneuverability, it also has a swiveling front wheel. It was also constructed to give the user an easier time when turning. 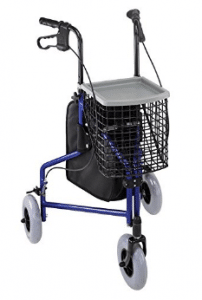 The Duro-med walker is FSA eligible and can support users who weigh up to 220lbs. 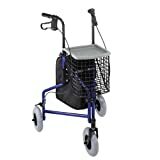 Using this walker in narrow halls and streets, shops, airports, tight or crowded areas, will not be an issue. It has been designed to be compact and made of Aluminum which is light in weight. The 3 wheel walker can also be folded with so much easy. It goes down to a size that can fit almost anyway. 3-Wheel Walker is unbelievable how little space is needed afterward. You won’t need to worry about clearing space in your car or look for non-existent space at home. The walker has an Amazon Exclusive Limited warranty. It comes in a royal blue color. Multiple storage options will always come in handy. The scenarios that you could use them for are endless. This 3 wheel walker also has a basket, a tray, and a pouch. If you want to go shopping or carry a few items with you in the house, you won’t be restricted. Depending on one’s health needs, the basket can also be used to carry an oxygen tank. 3-Wheel Walker is convenient in more ways than one. To top it off, when storing the 3 wheel walker, you also have the option of folding the basket as well. To make the walker all-terrain, it was designed with solid 8inch wheels. You will also be able to operate the 3 wheel-walker in a very easy manner. The ease of operation and safety enhancement is all thanks to a special loop lock made of internal aluminum casting. 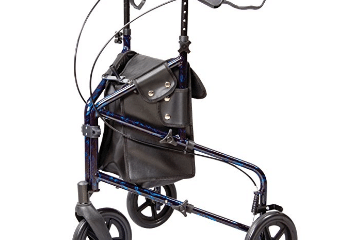 The handles of the walker won’t pose any complications to you. In fact, they can be easily adjusted in height. Using its self-threading knob makes it easy to do so. The handle height ranges from 31-38 inches but the walker’s overall dimensions are 24″(L) x 25″(W) x 31″(H). The 3 wheel walker weighs approximately 11lbs. 3-Wheel Walker is very well constructed. Health smart has designed this 3 wheel walker, with an 8-inch front wheel and 7-inch wheels at the rear. Because of this, moving across surfaces such as small stones and gravel, thick carpets, grass and more, will not be problematic. Most buyers describe this walker to be refreshing. 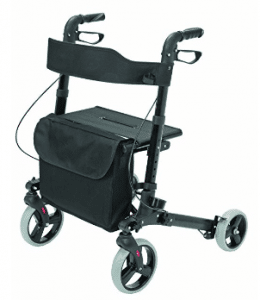 This is because it has been designed in a different manner, compared to medical walkers. The walker even has a storage tote with a large capacity. You can store or carry twice as much as you normally would. For added security of your valuables, the storage tote has a shoulder strap as well. This 3 wheel-walker will also provide you with options. You can choose from 3 different yet attractive colors. 3-Wheel Walkers also comes with a seat which is 18 to 10 inches in size. The height of the seat is about 21 inches. There is an 18 inches distance between the handles. The walker can be folded down to 25 by 16.5 by 11.25 inches. Carex Health Brands have their very own quick-collapse system. 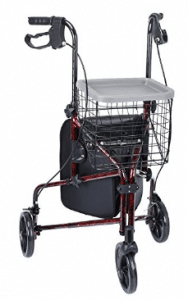 This system enables this 3 wheel walker, to instantly get down to a storage-friendly size. Using a walker in densely packed environments is always an issue. That is why Carex have designed this 3 wheel walker to be easy to manage by making it as compact as they can. What aroused my interest was how the walker was made so customizable. You can tailor it to meet your needs to achieve maximum comfort. 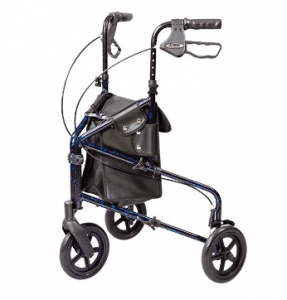 3-Wheel Walker is one walker that has been thoughtfully constructed, down to every detail. 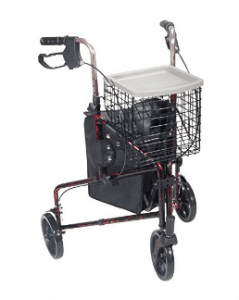 With this walker, you will surely have achieved some sense of independence. It will provide you with high performance, as expected with Carex Health Brands 20years experience. The 3 wheel walker has locking brakes. The walker’s wheels are 7.5 inches in size. A 3 wheel walker is not something that we buy for short term usage and put away. NOVA Medical Products understand that to the fullest. They have constructed this walker to outlast its competitors. Replacing this walker is not something that can easily happen. It is very sturdy; you won’t have any doubts when it comes to its stability. In case it gets exposed to water, the walker is made to be resistant to any rusting that may occur. You also won’t need to worry, if it ever falls from a height or collides with something. Reason being, the Walker has also been designed to be resistant to cracking. When all these features are combined, the durability of this 3 wheel walker becomes unquestionable. Its handle adjustments are 33″ – 37.25″. The walker can support up to 250lbs. Drive medical emerge as the number one 3 wheel walkers. You will instantly notice this walker when placed among others. This is because it has a carry pouch which is tan plaid. I would definitely recommend it to people who want a change of pace. 3 wheel walkers can also be stylish and attractive in their own way. Aside from all that, the pouch is very secure to keep your valuables in. What also makes it popular is that it can support a wide array of users. Reason being, the walker was constructed to handle a maximum capacity of 300lbs. 3-Wheel Walkers has casters which are 7.5 inches. The walker weighs about 11lbs.